Garlic has many uses and health benefits. It has been used by people for thousands of years and was used in Ancient Egypt for both its therapeutic and health benefits and culinary purposes. Garlic can lower LDL and total cholesterol. For people with high cholesterol, garlic supplementation seems to reduce LDL and/ or total cholesterol by around 10 to 15%. Oxidative damage from free radicals can contribute to the aging process. As a powerful antioxidant, garlic supports the protective mechanisms of the body against oxidative damage. The combined effects on reducing blood pressure and cholesterol levels, along with the potent antioxidant properties, can help prevent common brain diseases like dementia and Alzheimer’s disease. High doses of garlic supplements have been found to increase antioxidant enzymes in people, as well as considerably reduce oxidative stress in individuals with high blood pressure. The sulfur compounds in garlic have been found to protect against organ injury from heavy metal toxicity. Garlic can end your hair loss problems due to its high levels of allicin, a sulfur compound that was found to effectively treat many hair problems, especially hair loss. Simply rub sliced garlic cloves on the scalp, squeezing as you go for the most benefits. Alternatively, you can infuse garlic oil and massage it into the scalp. It may not be a key ingredient in the drugstore acne medications, but this herb makes an incredible natural remedy to banish unsightly blemishes. 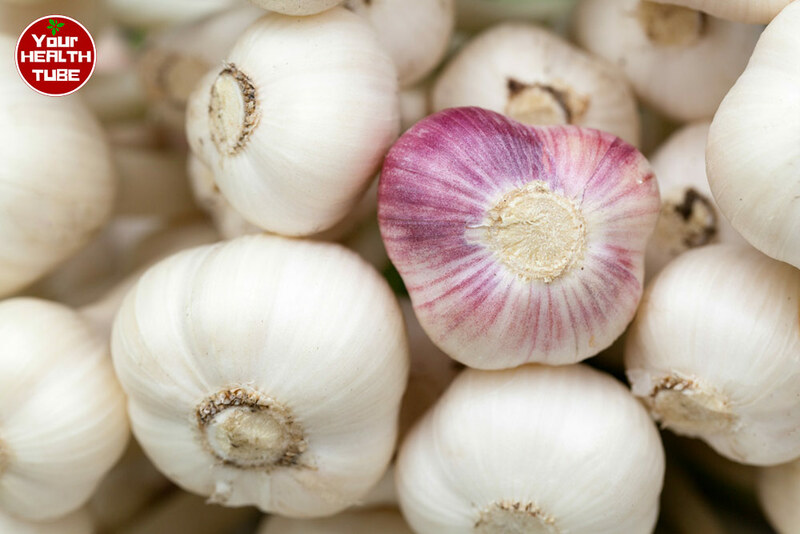 Garlic is a great antioxidant that destroys bacteria, therefore, rub a sliced garlic clove on the pimple for a topical treatment. According to many nutritionists, garlic can help you control the weight – a study found that it can reduce your weight and fat stores. Try to cook with garlic regularly in order to take advantage of this amazing benefit. Due to its great antioxidant content, garlic can benefit your immune system. Try to include this herb more in your recipes in order to consume it more often. If a cold does sneak by, make yourself a cup of garlic tea: just steep minced or chopped garlic in hot water for 5-10 minutes, strain and drink. You can add a bit of ginger or honey to improve the taste. However, according to a study published in the American Family Physician, prophylactic usage of garlic may reduce the frequency of colds in adults, but it does not have effects on the duration of symptoms. Garlic has been used all over the world for centuries. Many records point out that garlic was in use when the pyramids in Giza were built, about 5000 years ago. According to the Journal of Nutrition, Hippocrates (circa. 460-370 BC) – the ancient Greek physician, known as “the father of Western medicine”, recommended garlic for a wide range of illnesses and conditions. Hippocrates promoted the benefits of garlic for treating fatigue, poor digestion, parasites, and respiratory problems. The Olympic athletes in Ancient Greece were given garlic – probably the first example of “performance improving” agent used in sports. From Ancient Egypt this herb spread to the other ancient societies of the Indus Valley (western India and Pakistan today) – and from there to China. According to many professionals, England’s royal botanical center of excellence, the folks of ancient India treasured the healing properties of garlic and also believed it to be an aphrodisiac. The upper classes usually avoided this herb because they despised its strong smell, while monks, “…adolescents, widows, and those who were fasting or had taken up a vow couldn’t eat garlic due to its stimulant quality”. Throughout history in the Nepal, East Asia, and the Middle East, garlic has been used to treat hypertension (high blood pressure), bronchitis, liver disorders, rheumatism, fevers, diabetes, intestinal worms, flatulence, dysentery, and TB (tuberculosis). The Portuguese, Spanish, and French introduced garlic to the New World. Experts found it interesting that numerous cultures in history that were never in contact with one another had similar assumptions regarding the healing benefits of garlic. Because of its proven anti-inflammatory properties, it can be useful in relieving psoriasis outbreaks. Just try rubbing some garlic oil on the infected area for the rash-free and smooth skin. Garlic has anti-fungal properties that can help your relieve itchy Athlete’s foot. Simply soak your feet in a bath of crushed garlic and warm water. Experts are not sure why, but mosquitoes don’t like garlic. A research in India found that individuals who rubbed a concoction from garlic on their legs and arms were not disturbed by the annoying buggers. Simply make a solution of petroleum jelly, garlic oil, and beeswax as a natural repellant or just put some cloves of garlic nearby. Placing a bit of crushed garlic directly on the cold sore is a popular cold sore natural remedy; the powerful anti-inflammatory properties of garlic can help reduce swelling and pain. According to scientists, garlic supplements can also speed up the healing process. A city in Iowa use donated garlic salt in order to get rid of ice from roadways. So, next time you stumble on garlic salt in the back of the spice cabinet – remember to save it for an icy walkway. Fish are really attracted to the smell of garlic that you could buy bait with the scent built in. You can also get this advantage by making your own using food scraps and lots of cloves. Even though no human trials have measured the effect of garlic on bone health – rodent studies have found that it could diminish bone loss by improving estrogen in women. A research in menopausal women showed that a daily dose of garlic extract (which is equal to 2 grams’ raw garlic) significantly reduced a marker of estrogen deficiency. This submits that this herb may have beneficial effects on bone health in women. Certain foods like onions and garlic have also been found to have a beneficial effect on osteoarthritis. Garden insects don’t like garlic, therefore, make a natural pesticide using mineral oil, garlic, liquid soap, and water. Pour into a spray bottle and mist the plants to keep away damaging critters. See also: Houseplants to Improve Indoor Air Quality: NASA Approved! Raw garlic is usually measured for medicinal and cooking purposes by the clove. Garlic cloves are filled with numerous health-promoting components. Garlic also contains allicin and alliin, which are both potent health-promoting sulfur compounds. The benefits of allicin in garlic are especially well-researched in research. Scientists are interested in the potentials for these sulfur compounds derived from this herb to treat and prevent deadly and chronic diseases, such as cardiovascular and cancer disease, among other benefits of garlic. Asthma patients shouldn’t eat garlic as it may have certain side-effects. Don’t eat more than 2 to 3 cloves of garlic daily without consulting your GP. Garlic needs to be avoided before medical operations or surgeries. For centuries, garlic was thought to have numerous culinary and medicinal properties. We now have the science to confirm these impressive benefits of garlic.